Following Saturday’s 79-75 overtime win in East Lansing, Indiana returns home on Thursday to take on Iowa at Simon Skjodt Assembly Hall. The Hawkeyes are 17-5 overall and 6-5 in Big Ten play. Was Indiana’s thrilling win over Michigan State at the Breslin Center a turning point? We’re about to find out. The Hoosiers are still in most NCAA tournament bracket projections despite their recent seven-game losing streak and can solidify their position with wins in two home games this week. First up is Iowa, which is ranked No. 20 in the latest Associated Press top 25 poll. The Hawkeyes are coming off of an impressive 74-59 home win over Michigan last Friday. Iowa owns one of the Big Ten’s best offenses, but also has the league’s worst defense. After three straight NCAA tournament appearances from 2014 through 2016, Iowa missed the tournament the last two seasons. The Hawkeyes are in great position to get back to the tournament this year thanks to an unbeaten record in the non-conference and some solid league wins (Michigan, Nebraska, Ohio State). Iowa likes to play through the post and has two capable scorers inside in Tyler Cook and Luka Garza. Cook, a 6-foot-8 junior, tested the NBA draft waters in the offseason, but returned to school with the hope of improving his stock. That hasn’t happened as Cook’s conference only efficiency numbers have taken a dip this season. He’s shooting a respectable 51 percent on 2s in league play, but has a turnover percentage of 22.5 percent and is making just 65.4 percent of his free throws against Big Ten foes. Given that Iowa is seventh nationally in terms of percentage of offense generated from the foul line, that’s a number Cook needs to improve upon. Garza, a 6-foot-11 sophomore, is second on the team in scoring at 15.1 points per game. He’s fifth in the conference in 2-point field goal percentage (62.4). He’s capable of stepping out and hitting the occasional 3-pointer (7-for-26 in Big Ten play) and is an excellent free throw shooter at 84.9 percent overall. Junior point guard Jordan Bohannon is a knockdown perimeter shooter and an elite free throw shooter. Bohannon is making 40.7 percent of his 3s in conference play and 90.6 percent from the free throw line. At 6-foot-1, Bohannon isn’t a great finisher at the rim, so it’s important to make his catches tough on the perimeter and force him to drive the ball into shooting attempts at the rim. Per Hoop-Math, Bohannon is shooting just 37.9 percent at the rim this season. Freshman wing Joe Wieskamp was a four-star recruit and top 60 player out of high school and the Iowa native is living up to that lofty ranking. He’s Iowa’s third leading scorer (11.4 ppg) and is shooting 42.9 percent from distance this season (40 percent in league play). Unlike Bohannon, Wieskamp can also go to the rim and score efficiently. He’s shooting 68.5 percent at the rim this season. Junior guard Isaiah Moss is the team’s fifth leading scorer and is another shooter that you can’t leave on the perimeter. Moss is shooting 45.6 percent on 3s for the season and 50 percent in league play. Forcing him into mid-range jumpers is important as he’s actually more efficient from behind the 3-point line than he is on 2s (41.3 percent on 2-point jumpers). Freshman Connor McCaffery is the team’s backup point guard, but isn’t a scoring threat. He’s made just one 3-pointer all season and is shooting just 42.3 percent on 2s. His assist rate (23.1) is eighth in the conference. Senior Nicolas Baer is a very good defender – he leads Iowa in both steal percentage and block percentage – and is another piece who can knock down shots from the perimeter. Baer is hitting 37.9 percent on 3s in his final season. Junior Ryan Kriener matched his career-high with 15 points in Iowa’s win over Michigan and is another big body that McCaffery has available to utilize for post scoring. Kriener is 6-foot-9, 255 pounds and is shooting 61.2 percent on 2s this season. Even after holding Michigan to just .81 points per possession in Iowa City, the Hawkeyes still have the Big Ten’s worst defense in league play. 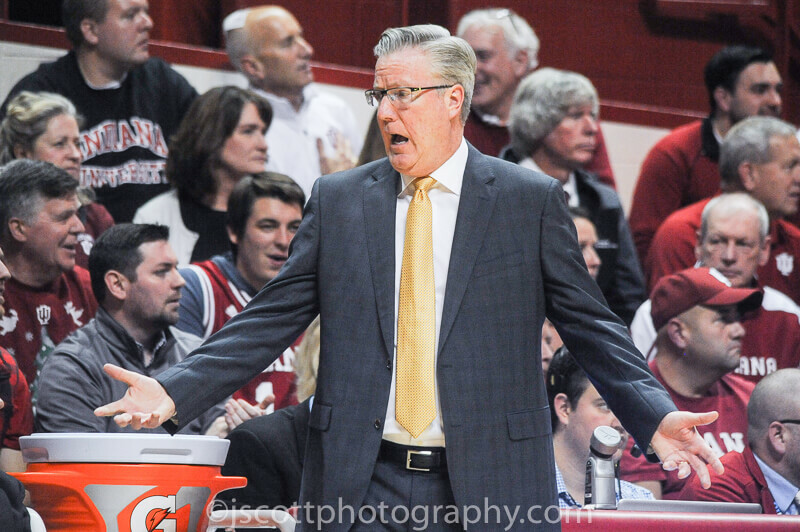 Big Ten opponents are scoring 1.09 points per trip against the Hawkeyes and are shooting 54.8 percent on 2s. Iowa’s transition defense is a major weakness. The Hawkeyes rank in just the 29th percentile nationally in transition defense, according to Synergy Sports. Iowa is making up for its defensive efficiencies with strong shooting across the board. The Hawkeyes are fourth in Big Ten play in 3-point shooting (37.7 percent), third in 2-point shooting (50 percent) and second in free throw shooting (75.6 percent). Iowa has the Big Ten’s third best free throw rate (FTA/FGA). The KenPom projection is Indiana by one with a 53 percent chance of a Hoosier victory. Sagarin is more bullish, predicting IU to be 2.5 points better on its home floor. 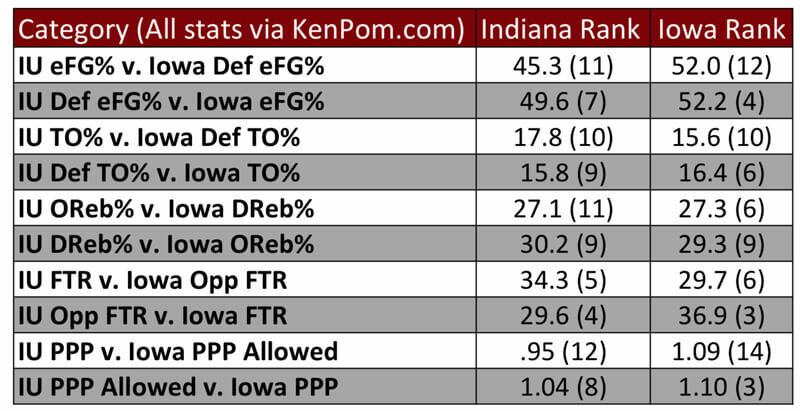 Having both Juwan Morgan and De’Ron Davis available and healthy is pivotal for Indiana in this game as Iowa’s post offense is among the best in the league. This could also be a game where Jake Forrester gets some minutes off the bench if foul trouble becomes a problem. This game will likely come down to Indiana’s ability to score enough to keep up with a high-powered Hawkeye offense. Iowa has scored 70 or more points in five of its six Big Ten road games and had 87 and 89 in their last two away from Carver Hawkeye Arena.